We explain the advantages of the Sky+ service – Sky’s digital TV set-top box that changes the way you watch and record your favourite TV shows. Sky’s hype about their Sky+ box is that it will ‘change the way you watch TV‘… and for once, the hype isn’t wrong. Sky+ is a combined satellite TV receiver and a Personal Video Recorder (PVR), which records up to 180 hours of telly onto a built-in hard-disk. Sky+ gives you a huge amount of control over how you watch and record TV. As standard, Sky is now providing the Sky+HD box to new customers. This new Sky+ box is intended for use with Sky’s HD TV service, but that’s optional (you can upgrade your Sky+ to HD later should you wish). Free box and setup: Join Sky+ and get a free Sky+ box with free standard setup, and an M&S Voucher. Price, from £21.50 a month. For more details about Sky+, and to order, go to the Sky+ site (or Sky Ireland). Select recordings from your Sky Planner, and copy them off to a video or DVD recorder. Follow a series – The excellent ‘Series link’ can be used to record episodes of your favourite series automatically, keeping track of schedule changes, and avoiding repeats. Pause live TV – handy for when the phone rings. The Sky+ box really is a top offering – you’ll find you change your TV watching behaviour – no need to worry about setting the video recorder to keep up-to-date with a series, and with the drive holding around 180 hours of shows, no more running out of tape. You also find you can stagger your watching – less more programme clashes, and using Live Pause means you can fast-forward through adverts. You can read more about how Sky+ works on the Sky+ Site. Sky+ was recently awarded top of the PVRs in a PVR survey conducted by a leading UK consumer organisation. The Sky+HD box gets our top recommendation… go get one! If you’re worried about paying too much for Sky, consider YouView. As well as live digital TV, YouView comes with a high-spec digital recorder (with live pause and series link). On demand content, movies, sport, catch-up TV over the Internet, plus Freeview channels, Freeview HD and extra premium channels. Details on our YouView Explored section. Sky Anytime is available on newer Sky+ and Sky+HD boxes. This service makes use of extra disk space on the newer Sky’s hard drive, and downloads a selection of Sky’s content and movies to the box while the box is idle. These shows can be viewed on demand. More details on this service on our Sky Anytime page. Installation Sky+ is available directly from Sky Digital and requires installation by a Sky installer. Your Sky dish will need to have two cable feeds run from the Sky dish to the Sky+ Digibox. Normal Sky installations only require one cable feed from the satellite dish LNB, but as the Sky+ box has two tuners (to allow simultaneous viewing and recording of different channels), then two feeds from the dish are required. Like standard Sky boxes, the Sky+ box must also be connected to a UK phone line. It is possible to buy a Sky+ box from sources other than Sky, and fit them yourself. This is not recommended by Sky – it means fitting an LNB to your dish (if the LNB doesn’t have multiple outputs), then running satellite cabling from dish to box. Sky has to enable Sky+ on your set-top box (not always easy if you didn’t get the box from them). We also understand that Sky Technical Support won’t support systems that they didn’t install. For most people, it’s a lot easier to get Sky‘s professional installers to do the work. More details on Sky+ installation at sky.com. For more, or to arrange Sky to visit and upgrade you to Sky+, go to sky.com/shop/boxes/sky-plus-box. Latest version To check which version of software your Sky+ box is using, press the Services button, System Setup menu, option 5, ‘System Details’. You can force your Sky box to update to the latest software. The procedure can be found on the Satcure FAQ. Copying recording to DVD You can connect a video or DVD recorder to your Sky+ box, to allow you to copy shows recorded on your Sky+ box… great for archiving series recorded using Sky’s Series Link. Note that there is a restriction on copying Sky Box Office movies. For help with connecting to a recorder, see our Connection page. Also, see our How to record Sky TV page. Consider something like the Dazzle Video Creator (from Maplin or PC World), or alternatively the slightly cheaper Aver Media AVM003. These solutions allow you to copy video content to a PC via USB. You can connect the output of your Sky digibox to another TV set in the house by running an aerial cable from the Sky box RF output aerial socket to another TV telly. You can also use a Sky Link so you can change channels from the other room. More on this in our Sky in other rooms section. 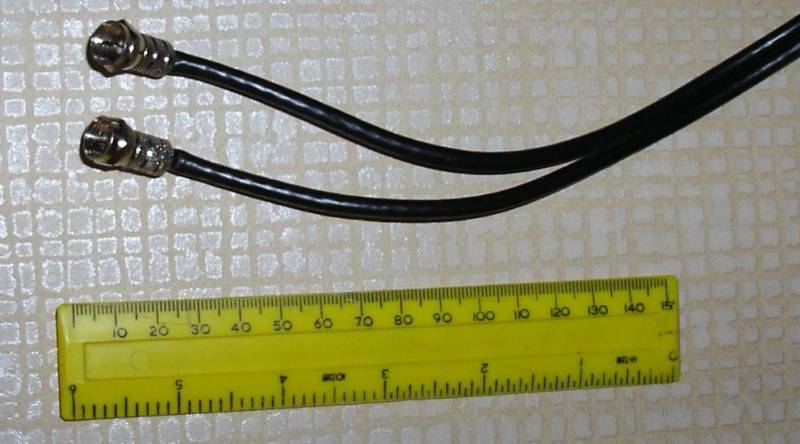 To save running cables, you may be able to use a wireless video sender. For more on these options, see our Sky in other rooms page. Programming Sky+ remotely There are a couple of ways to set your Sky+ box remotely, including control by SMS text message from your mobile phone, or from your PC web browser. See FrequencyCast’s TV Control page for more on this. As an alternative, there’s a handy product called Slingbox. If you’ve ever been away from home, and found you’ve forgotten to set Sky+, or you’ve wanted to watch a recording while you’ve been away, then the Slingbox may be the answer. Connect a Slingbox to your Sky+ box and to your Broadband, then control and watch your TV recordings over the Internet. For more, see our Slingbox page. Sky+ Manual If you’re after a user manual for Sky+, you can download a PDF of the manual from Sky’s website. Right-click on the following link, and select “Save Target as”: Sky+ User Guide. Note that the manual is a 30 Meg download. If you’re unable to download the manual and you’ve lost yours – you could try contacting Sky for a replacement paper manual. Otherwise, if you need some information from the manual, ask in our forum. Sky+ with no subscription Using the Sky+ PVR features, such as recording, live pause and series link, is free as long as you subscribe to one or more Sky packages. If you want to use the box’s PVR features, but you don’t want to subscribe to a Sky channel package, you can use the Sky+ features with the Free to Air channels on Sky, however it’ll cost you £10 a month to use Sky+. You can set up the Sky+ subscription by contacting Sky Customer Services. Installer menu The technically-minded out there may be interested in the hidden “installer” menu. SCART, HDMI, RF aerial in, 2 x RF aerial out (modulated), RJ11 telephone, 2 x phono audio out, composite video out, RS232, co-ax and optical audio (for Dolby Digital 5.1), Ethernet (for Sky Anytime+), USB (reserved for future use) and SATA (reserved for future use). Rewind live TV Sky+ allows you to rewind live TV. It does this by constantly recording whatever channel is active to hard-disk. You can set how much you hold in the ‘rewind’ window from Services>Sky+ setup. The options are 5, 15, 30 or 60 minutes, or you can disable the service if you wish. Connection to phone line Sky Digital customers get subsidised installation and digibox provided that the box has a connection to your phone line. Buy your own box? Yes – if you wish, you can buy your own Sky+ or Sky+HD box, rather than having to go through Sky. Note that you will only be able to use Sky+ if you have two separate feeds from the satellite dish, and if your dish has an LNB with multiple outputs – as Sky+ uses two tuners, not one. Once connected, you’ll need to call Sky Customer Services to get them to “marry” the serial number of your new Sky+ box to your Sky viewing card, and then to activate the Sky+ subscription. Obviously Sky won’t activate a box unless they’re happy that it’s legitimate, and you’re not misusing your account by swapping cards between boxes on a regular basis. If you’re brave, you can pick up a Sky+ box cheaply on Ebay, but you’ll not have much comeback if your second-hand Sky+ is damaged, the disk drive or power supply don’t work, or Sky refuse to activate it for use on your card. 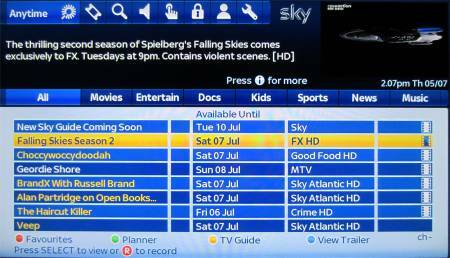 Programme padding The Sky+ box supports ‘padding’ or recording offset, which is a setting that allows you to add a number of minutes of recording time to the scheduled start and end times of programmes. This means that the box will record a few extra minutes in case a program doesn’t start quite when it should, for occasions where the Sky+ EPG isn’t aware of overruns. To edit the settings, press Services, and select Sky+ setup. Cable We’ve been asked what the Sky Plus cabling (running from dish to box) looks like. Here’s a photo of our Sky+ cabling. Click the image for a larger photo. Remote controls Problem with your remote? Make sure you’ve put the batteries in correctly, round the right way, and that they’re making contact correctly. Also, make sure the batteries aren’t flat. When you press the buttons, there should be a little red light at the top of the unit that indicates it’s working. TV Remote help.Other problems: If your remote is working, but isn’t controlling the Sky box, you may have pressed the TV button, so press Sky and try again. The only thing that can wrong with a remote control, is if it’s left without batteries for more than ten minutes – if this happens, it may lose it’s ability to control the TV. It should still be fine with Sky / Sky+ though. To get the remote to work with your TV, you need to enter a four digit number that matches your TV manufacturer. Refer to your Sky / Sky+ manual for these codes. How long are recordings kept? Sky+ and Sky+HD give you a fair amount of control over how you keep shows on your box. A typical setting is to have Sky+ record shows, and automatically delete shows you’ve watched when your disk is nearly out of space. There’s also an option from the Sky+ planner to mark a recording as one to “Keep” to the system will never automatically tidy it. DVD / CDs We’ve been asked if the Sky+ boxes will play back DVDs or CDs. The answer is a firm “no”. The Sky+ box doesn’t have a slot for a disk to be inserted – you’ll need a separate DVD player connected to your telly to play DVDs and CDs. Going into Standby To earn their green credentials, Sky’s set-top boxes have Auto Standby, and switch off to conserve energy. This happens when the box has not been used for two hours after 11pm. Before going to Standby, you’ll see the message “Sky+ is about to go to standby – press backup to continue”. If the hard drive in the Sky+ unit is running all the time, it’s probably been set to use Instant Rewind, which constantly records whatever’s being watched, in case you want to rewind what you’re watching. To disable this, press the “Services” button, select Option 5 (Sky+ Setup) and set Instant Rewind to ‘Off’. Hard disk defrag? There’s a hidden feature to allow the (advanced) user to perform a tidy on the Sky+ hard disk, which is a little bit like a PC defragment. Many users have found that this has recovered valuable disk space. If you want to give it a try, you need to go into the Installer menu (see above). 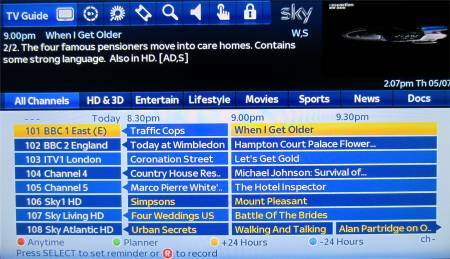 On older Sky+ boxes, press Services 4 0 1 Select to get to the Installer screen, then choose the “Sky+ Planner rebuild” option. SkyDigital undocumented – Secret keypresses and digibox information. I have recently changed the standard Sky box upstairs to a Sky Hd+. This only has one input cable and I realise that I need two to be able to watch and record at the same time. My question is :- do I have to run a separate cable for input 2 or can I split the one down stairs and run to the box upstairs? I still require both boxes to work independently from each other, or do I need to run another cable from the dish..